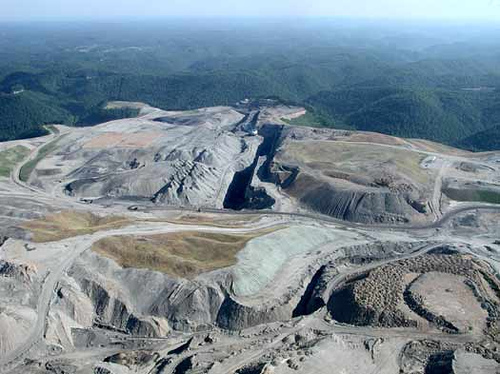 This photo of a mountaintop removal site appeared in the Huffington Post‘s article by Jeff Biggers, where he discussed some of the harmful effects of this method of strip-mining. Today, nine counties in West Virginia find themselves in a state of emergency following a chemical leak into the Elk River. According to The Charleston Gazette, the leak of 4-methylcyclohexane methanol originated in a compromised storage tank and, unchecked, overwhelmed the backup containment dike before leaking into the river. The results of exposure to the chemical are unknown, but residents in affected areas are being told to avoid any contact with tap water during a clean-up whose duration is yet undetermined. The immediacy of the many-faced “other” in today’s context of multiplicity spotlights the hypocrisy inherent in the human condition, stemming from our interconnectedness and the complexity of the web of life affected by our decisions. Try as I might to practice what I preach, despite good intentions I will never perfectly embody the ideals I espouse, just as the ideals I espouse will never be the full picture of goodness. Jesus proclaimed a kingdom of God present in the midst of an anti-kingdom marked by injustice and idolatry. For me, a most salient image of the fullness of the kingdom of God is a world where hypocrisy is not a given, where it easier, even when making decisions ignorant of their total consequence, to do good than to do harm. Even as I try to eliminate idolatrous practices from my own life, I cannot disembed myself from the fabric of a culture which is idolatrous, wherein the meanings of terms like “freedom” and “self-determination” are ahistorically frozen and absolutized. The temptation, in a world where toxic spills are to be expected and my complicity is unquestionable, is to give into the sense of despair and powerlessness. “Not even your future will be a mystery any more,” writes Wendell Berry, and, indeed, as today’s leak is (slowly and likely only partially) cleaned up, we collectively brace for the next headline beginning with the words “State of Emergency” and hope it refers to some far-off place where no one we love lives. But to give into despair is to be expected, and the resultant paralysis is just what the toxic systems need to maintain their hold on our imaginations. Tomorrow, I will wake up in a room heated by coal. I will turn on a light lit by coal. I will burn wood in a wood stove to avoid having to use coal, and thus I will contribute to the pollution and deforestation of my immediate environment. I may eventually decide to decrease my dependency on oil by switching to an electric car, powered by – you guessed it – coal. To deny my complicity is foolish and counterproductive. But if today I do not make an effort to turn the light off when I leave the room, or to reduce my carbon footprint, or to write this blog post about the situation of the people in West Virginia, I surrender the power that I have despite my complicity to effect change. I relinquish my role in making the kingdom visible in the midst of the anti-Kingdom and thus lose my ability to see the signs of the kingdom’s presence around me. Wendell Berry wrote, “Be joyful though you have considered all the facts,” and that is the challenge before us, from the hollers of West Virginia to halls of power. Having considered the starkness of the anti-kingdom and our own complicity in its perpetuation, let’s be joyful anyway and try our hardest to change it. The full content of the pastoral letters This Land Is Home to Me and At Home in the Web of Life can be read here. Calculate your connection to coal here. 1. Catholic Bishops of Appalachia, This Land Is Home to Me (n.p. : Catholic Committee of Appalachia, 1975), 10. 2. Catholic Bishops of Appalachia, At Home in the Web of Life (n.p. : Catholic Committee of Appalachia, 1995), 44. 2 Responses to "Water, Hypocrisy, and Hope in West Virginia"
Fresh off a service trip at Nazareth Farm in Doddridge County, WV, and in the midst of composing a research paper for a Religion, Peace, and Justice course, I thank you for this important, gorgeously articulated, and compelling article. I would love your contact info, Ms. Robertson! Thanks, Olivia, for your kind words, and I’m so happy to hear that this article resonated with your experience at an awesome place like Nazareth Farm. I’ve sent you an email so that you can contact me with any questions.